Divikesh Kumar never in his wildest dream thought that his first trip in an aeroplane would take him to Buckingham Palace in London on May 13 to receive his gold award. The 18-year-old Year 13 student of Khalsa College in Ba has never even ridden on any plane. His background in cane farming was perhaps that extra boost that enabled him to journey through the many tasks he and the eight other Gold Award recipients of the Duke of Edinburgh International Awards went through. The only difference between them now is Divikesh gets the privilege of travelling all the way to London and step into Buckingham Palace to receive his Gold Award there. 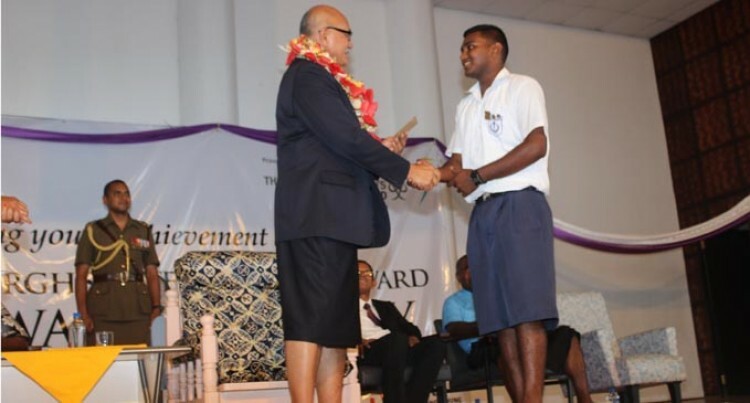 He was chosen to represent the Gold Award recipients from Fiji in London. The other recipients received their awards from President Major-General (Retired) Jioji Konousi Konrote in a ceremony held at Xavier College in Ba yesterday. Divikesh was over the moon when he received his airline tickets. “I come from a cane farming family and to receive this award and represent Fiji in London is so overwhelming,” he said. “I am so happy to be able to represent my country, my school and all the recipients of the different awards. Divikesh said he did not know he was chosen until he arrived in school one morning to be told of his trip to London. “The programme has certainly lifted my self-confidence and it also instils in you good leadership,” he said.